It's Tuesday: That Means it's Time for "Canine Cooking Corner" #3! Welcome back to another blog-isode of our "Canine Cooking Corner!" Tonight, Wolf has his bowl all ready to mix up some "Turkey Mish-Mash" and do a little taste tasting along the way! 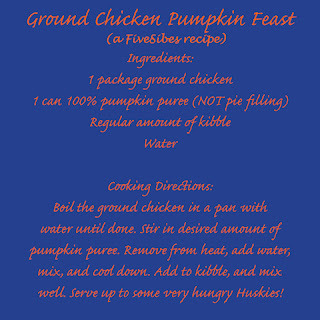 This recipe is great for roasted turkey (or chicken)...and it's 100% Sibe tested and approved! If you have any leftovers leftover from Thanksgiving, here's a great treat for your furkids and I promise they will lick their bowls clean! 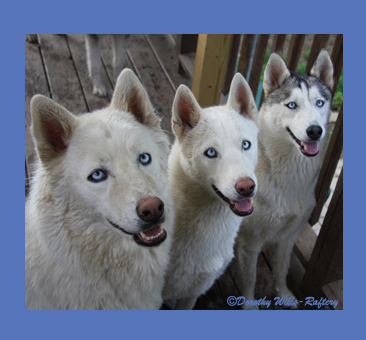 We also came across some great canine recipes over at Husky Haven that we will be whipping up soon. While there, check out their sweet rescue Sibes in need of a loving home. Please feel free to link to us and/or leave us a "woo" or two about what your furpal's fave recipe is. Until next Tuesday, keep cookin' and Bon Appetit! While watching his Hu-family decorate, Wolf is thinking about all the gifts Santa Paws is going to bring him and his Sibe family this Christmas! So what's left to do after a few days of eating turkey and sweet potatoes, running wild in the yard, and a little Black Friday shopping on the Internet? Why sleep of course! 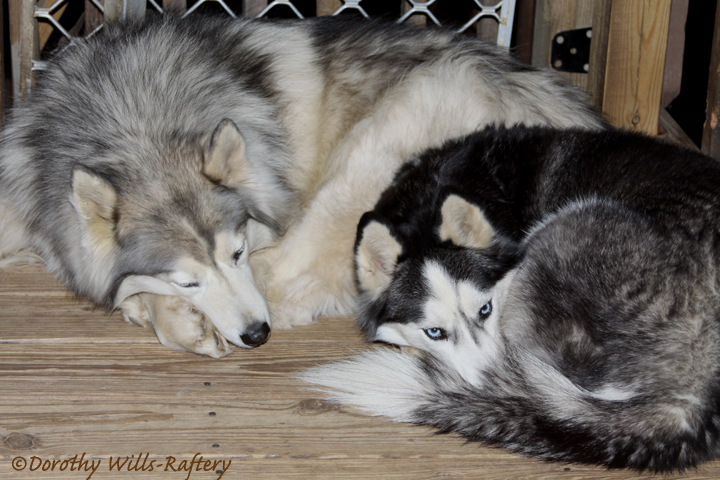 Sweet dreams, sweet Huskies...and canine pals everywhere! It's Thanksgiving and a time of reflection, giving thanks. Last week, we featured a Thankful Thursday, where we celebrated all the wonderful things we have to be thankful for, and there's so much more. We also, of course, love eating turkey and all the yummy fixin's! 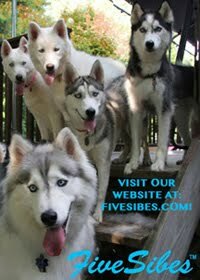 The FiveSibes celebrated this day in all the enjoyable ways a Sibe can. 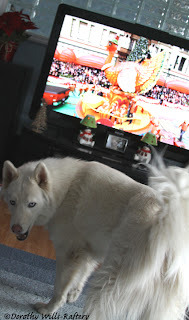 Kicking off the holiday, we watched the Macy's Day Parade. 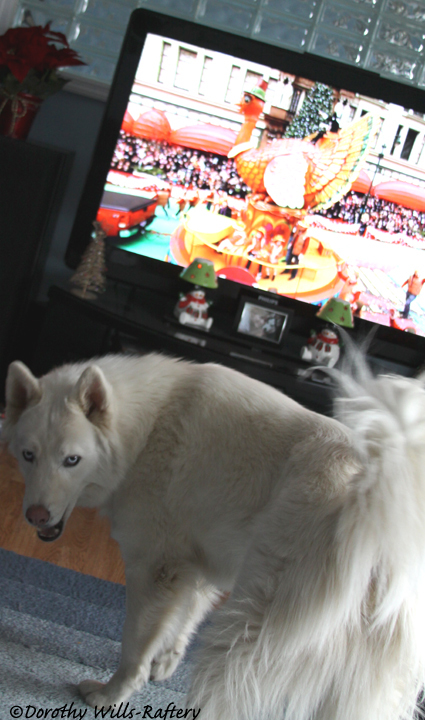 Wolf wants to know how why he wasn't in it aboard a sled float with his pack family. Maybe next year, Wolf??? 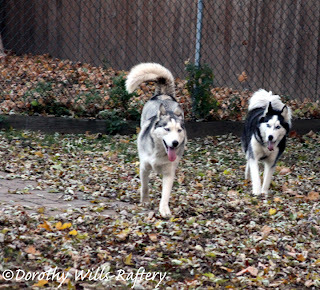 Then Wolf and sis Chloe kept getting running about and getting excited when they heard the words "turkey" and "yummies." 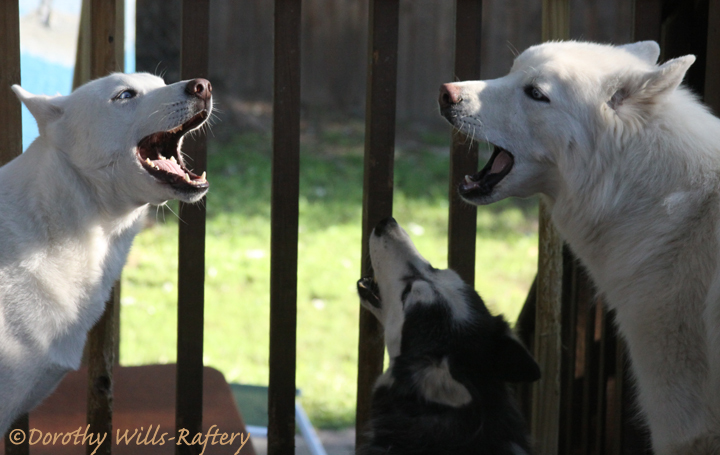 Chloe, Harley & Wolf howled their Thanksgiving greetings for all to hear! Sisters Bandit & Chloe checking in on the status of the stuffing. All FiveSibes waited very patiently knowing their turn for turkey would be coming very soon. Later in the day it was time to work off some of the turkey and sweet potatoes, Sibe style! 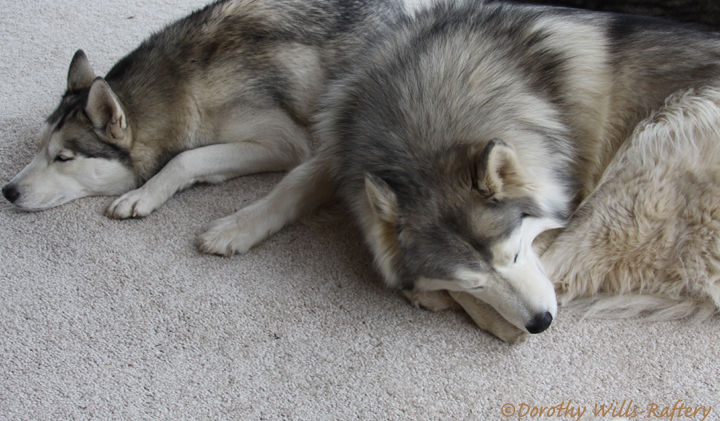 After dinner, it was time for a good ol' Husky nap for Wolf, Gibson & Harley. 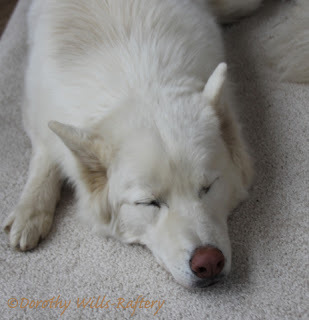 Turkey and exercise sure makes a Sibe sleepy ! Hope yours was a good one ! 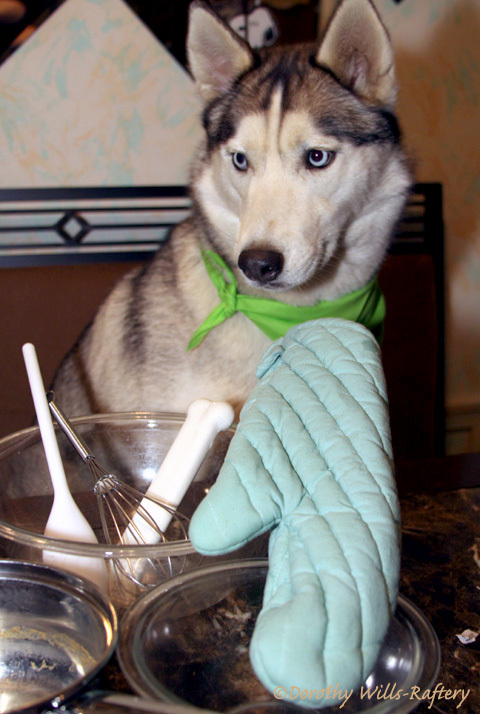 It's Tuesday, that Means it's Time for the "Canine Cooking Corner!" Chloe is ready to whip up some delectable fixin's...and do some of her own taste testing! 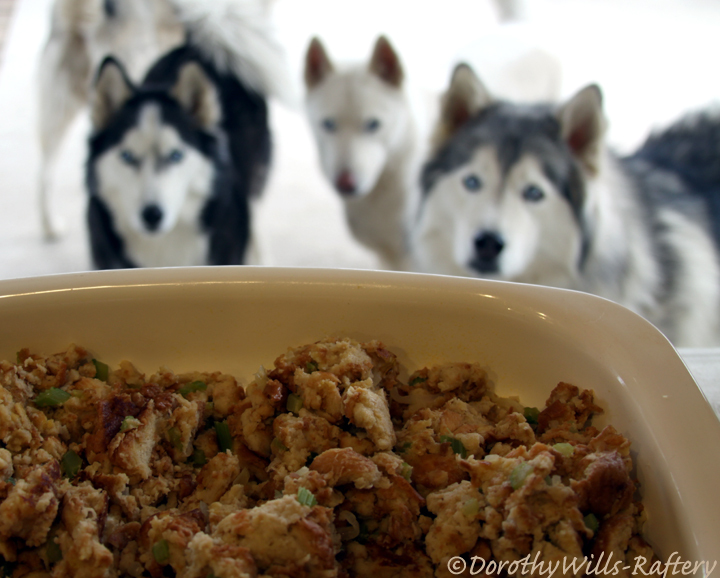 Happy almost Thanksgiving and welcome to the second installment of our "Canine Cooking Corner" Tuesday Blog Hop! Thank you to those who joined our inaugural recipe hop last week and also to those who wrote saying they will be hopping along in the future. We can't wait for you to join us! This week, the FiveSibes would like to share another of their favorite dishes, just in time for Thanksgiving--Ground Chicken Pumpkin Feast. And when this is whipped up for them, they get right down to the business of eating! We hope you'll enjoy this little video highlighting the low-fat, high fiber (nap-inducing) recipe! We look forward to seeing what types of goodies you have planned for this week! Last week, Peggy's Place came by and Debbie Does Coupons featured our debut on her blog! Very cool! There were also some paw-stompin', snout smackin', wooin' good recipes folks and furpals shared. As a matter of fact, I'm preparing to make the FiveSibes some of those Oatmeal Turkey Treats submitted by canine hopper Cooking with Dogs. We already have the ingredients. And, we totally agree that it will certainly be a handy recipe to have after Thursday's Thanksgiving turkey leftovers. We are looking forward to also trying some of the other recipes as well. 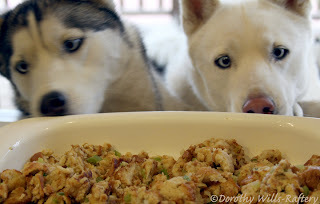 Gone to the Snow Dogs has a yummy pumpkin muffin recipe that will be dessert, and for some more delish treats, Norwood has shared his bowl-cleaning recipes! Tucker came by to share some feline food ideas that Smokie, our honorary Sibe cat, will surely enjoy! I'm hoping to have a Canine Cooking Corner page at a later date to more easily access all the shared recipes from our furpals and their Hu-families! So stay tuned! I wanted to discuss an important topic that is very personal in our Sibe-loving family: canine epilepsy and seizures. With November being Epilepsy Awareness Month, I wanted to take this opportunity to share my experiences with canine epilepsy and assure folks that our furpals can indeed live a happy, healthy, loving life with epilepsy. 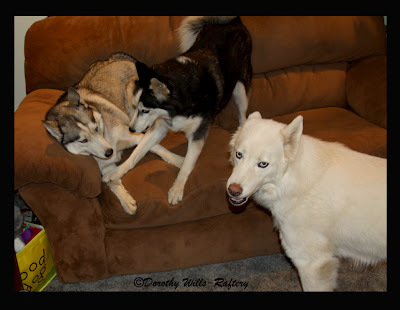 Had an awful scare this morning...let me know if any other Husky parents have had this experience: Woke up to a loud triple bang...went down to the family room to check it out and heard my Huskies crying a low soulful cry...I knew in my heart something was wrong...when I got into the family room, I found my three-year-old stiff as board in his kennel, foaming mouth, eyes wide and glassy and pupils dilated. For a few seconds he sounded like he was sucking air through his foaming mouth, then the breathing stopped. I thought I lost him. I was terrified and kept calling his name and petting him...I saw a faint, very faint twitch in his eye and kept talking to him & then ran to grab a phone and called our emergency vet hospital. When I turned back around, he had somehow miraculously gotten himself up and was terribly disoriented, pupils still dilated, and no real control over his motor skills. We got him to the emergency room and after awhile started becoming more and more alert. They ran some blood tests, all of which came back fine. He was transferred to our regular vet hospital where our vet admitted him for the day to test him and keep him for more observations. 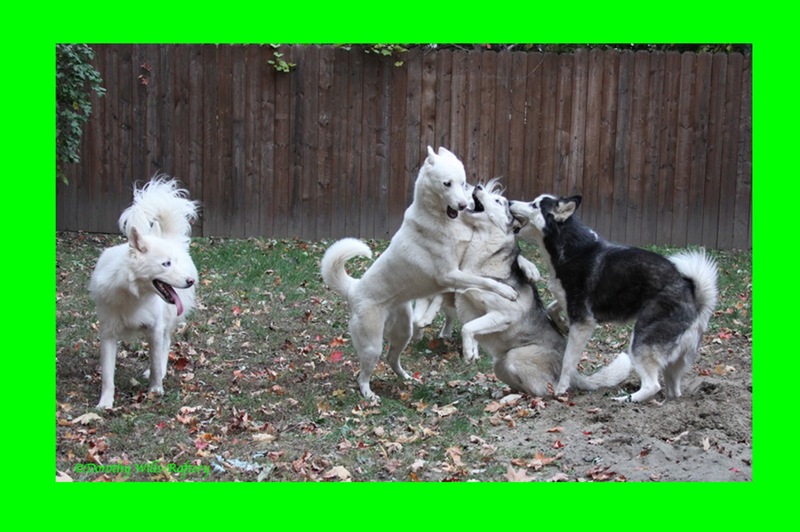 Conclusion - a seizure of some sort, possibly epilepsy, which they say is prevalent in Huskies. Apparently, the banging I heard was him having his seizure, although it lasted about a few seconds...followed by the five minutes or so of the complete stiffness...it felt like an eternity of hell for me. They did a liver profile bloodtest, which came back fine. THANK GOD he was alright...I started out the day thinking I lost one of my precious "kids" and it truly was a miracle to see him up after seeing him so stiff and foaming. So scary. We are keeping a close eye on him and I have now have a baby monitor connected to their bedroom and a portable one for me! The vet said he may never have another seizure, or he could have more, we have to take it day-by-day for now. It hasn't even been two months yet, and my 3-year-old Siberian Husky had another seizure at 3AM...at least this time I knew what was happening and wasn't so freaked since that first scary one in January. I sat right down by him and kept talking to him and kept a cold pack on him. He's here with me right now - and just out of it for about a half-hour, less disoriented, but a bit agitated. I had a suspicion something wasn't right as he didn't eat much during the day (he's 94 pounds and almost NEVER turns down a meal!) and then he threw up at dinner time. 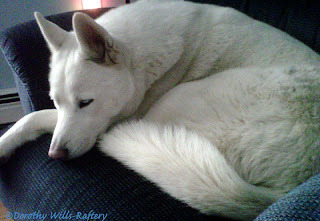 I'm trying to see if there was a catalyst - he usually eats breakfast around 9, and we had a construction guy here at that time, so he and the rest of the Husky kids stayed in the house for the morning, and his breakfast was pushed off a couple hours...it was much warmer, almost 50 compared to the usual 17. I've been feeding him twice a day to keep his blood sugar levels even, so I don't know if having breakfast later threw him off, or being in longer than out, or the warmer weather, or the "excitement" of having a stranger working here...I know it's said there's not always a "reason," but after he rebounded from the first one in January, I was hoping he'd never have another...or at least not one for a long, long, long time. Ugh. My poor boy. The ice cream suggestion worked well, followed by water, and then he searched out his bowl for a little food. I cleaned him up from the seizure with bath wipes and water, and now he is lying here by me on his bed in the living room. Well, no more sleep for me today-I'm watching him very closely - and he just let out a big sigh, so he finally in a relaxed state. It was interesting to look back now as his "gal" and younger siblings were crying for him (his gal still is! I'll have to let her come by him now), and when he first came out of the seizure and was still in the stage of disorientation where he couldn't see yet, he went over to nuzzle his sweetie and let her know he was OK. Amazing. He is so wonderful...and he has so much heart and soul. I just hope and pray he does not have another seizure for quite some time. 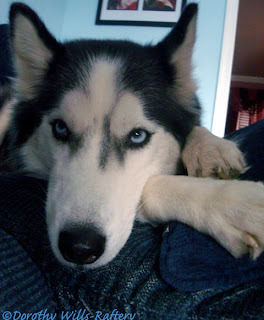 "My Husky is in the Hospital Now"
My boy's in the hospital now. 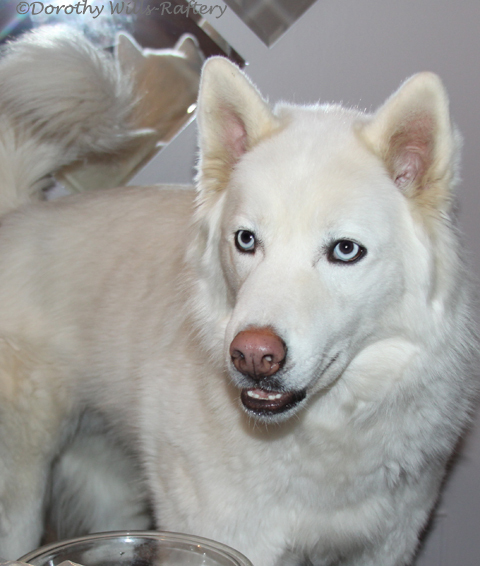 His third seizure was bad-muscularly. Our vet had us bring him to the vet hospital at 4PM. Although it seemed to last a shorter amount of time, he's now moved into having "clusters" of seizures. They suspect epilepsy. He's staying for observation and if he has a fourth one, they will give him a shot to break the cycle, then we'll go for an MRI before starting a course of permanent treatment for the seizures. I'm hoping he does not have anymore tonight. I will be checking in with the hospital in awhile. Possible stress from construction & heat could have led to episodes. His sweetie and younger sibling sis really really miss him. So do I. There are many more entries after that chronicling our journey, but those were the initial few scary days when it all began, almost two years ago. Instructions in case of seizure. A journal that contains entries of each episode, length of seizure, medication, side effects, results, etc. It also lists my vet’s number as well as the emergency vet hospital. An instant ice pack. (In a pinch, anything frozen in freezer works – the first time I used packages of frozen veggies and a frozen loaf of bread. A small cost to toss them for the great effect it had). Alcohol swabs. (I personally use just ice packs as I try to keep the chemical-stuff at a minimum). And I always keep a tub of Breyer’s All Natural Vanilla Ice Cream in the freezer (for post-seizure treatment to aid in raising up the blood sugar levels). 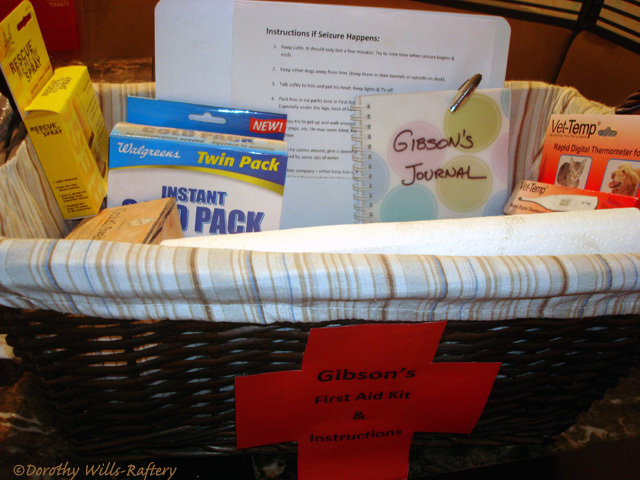 Let me wrap this up by saying – Gibson is doing well. Yes, he has indeed gained weight from the meds (he has remained on the duo dispensation of Pheno and Potassium Bromide and he is closely monitored). Yes, initially, he was extremely lethargic, and very out of it. I have since made some lifestyle changes for him (and for the other Sibes as well) that I believe help promote better overall health and help him combat his ailment. He is still on specifically timed meds (which I am absolutely religious about the timing) and under continuous veterinary care. I always have his checkups and blood tests done every six months so I can monitor things and be sure his medication levels are holding steady and that there is no indication of liver damage. I have added (as you have read in previous posts) pure pumpkin puree, green beans, and carrots to his food as natural, healthy, lo-cal, fiber and nutrient packed ingredients. (My inspiration for starting the Canine Cooking Corner Tuesday blog hop). I’ve cut down on “chemicals” by giving him raw carrots instead of processed snacks. 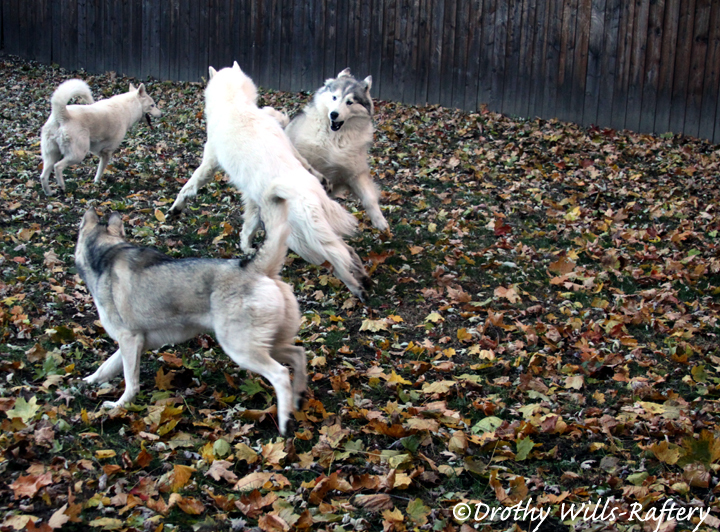 I take him for walks and let him run with his pack family. He has a canine cooler bed to keep his body temperature cool. There is an a/c and fan in the Sibes’ bedroom, and they have a pool on hot days to run through. I try not to change his environment. I purchased an adjustable pet ramp to use as a stretcher (a blanket will also serve this purpose for lighter dogs). And, as my awesome vet recommended, I let him "live his life." I pray he may never have another seizure again and that the meds do not harm him in the long run. But above all, I let him know just how much he is loved everyday. I don’t know if this regime will keep the seizures at bay, but all I know is I need to try everything in my power to give him a normal, healthy, happy, loving life. He deserves absolutely nothing less. I believe it’s my turn to pay-it-forward for all the wonderful folks who answered my call of need. 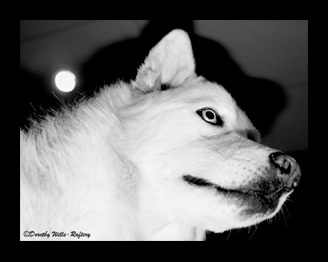 I can only hope that by sharing my experiences with canine epilepsy, I may in turn give hope to other Hu-families who are experiencing, or may experience, seizures in their beloved pets. I'd like to add an important footnote here: always, always, always contact your vet immediately if your dog is having a seizure. Key factor is to be sure he is safe and secure. Keep other pets away from a seizing dog. Move anything that could get knocked over or fall on him while seizing. I personally spoke to Gib and stroke his fur to let him know I was near so he had nothing to fear, just in case he had any type of awareness during the seizure. There will be a distinct odor from discharge during the seizure, so don’t be alarmed. And due to the immediate temporary “blindness” they experience, never leave him alone. Get a little water and natural ice cream into him afterward. Being part of a wonderful family. Having a beautiful daughter who is my best friend. Having an adorable abandoned cat accept and adopt us . Having good health for family, friends, and furbabies. I've now added to this list some new friends we are thankful for--both furpals and human. Thanks to the wonderful thing called technology that includes Tweeting, blogging, chatting, texting, and communicating via other social networking systems, the FiveSibes and I have "met" some truly nice, inspirational, and supportive folks and their furbabies. It's great to have the capability of talking about our pets and their love, devotion, and crazy antics with others who share the same passion. It's great to have a network where we can reach out through happy, fun, difficult, learning, and challenging times to talk about our pets with other Hu-parents who share in the love, care, and compassion for animals. Even with all the love, loyalty, and devotion we receive from our pets, there are also - as with everything in life - sometimes sad and tragic experiences as well. It is nice to have a place to come to and join others to share in some of those sad trials and glorious tribulations. A network of support. A comfortable haven. So added to my list of things to be thankful for are the connections the FiveSibes, Smokie the cat, and I have made through this blog and social networking. We wholeheartedly thank you for your support, your readership, and your conversation. Our very first "virtual" Sibe friends Shiloh and Shelby of Gone to the Snow Dogs for welcoming us and helping to spread the word about our blog to their Sibe friends and furpals when we first sledded into the blogosphere last February! 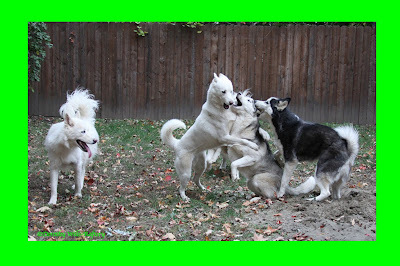 Our very first commentors, The Op Pack from Chronicle of Woos, Turbo the Sibe, Gone to the Snow Dogs, Khyra The Siberian Husky And Sometimes Her Mom, Remington, Lorenza, Steve, Kat & Wilbur, Fern of animal lover, quilt lover, Holly and Khady, Suka, SibeFamily, Kira The BeaWootiful, and The Thundering Herd. 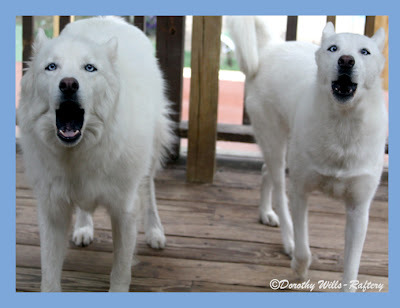 24 Paws of Love for our very first blog award, "Strange Men in Pinstripe Suits!" 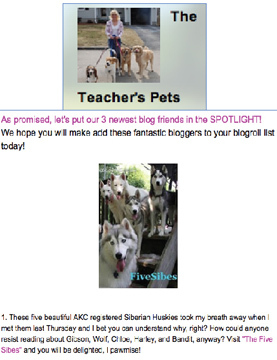 PetsDirect for our very honorable "Inspirational Top Blogger" award! Facing50withhumour for our most recent awesome blog award, "Stylish Blogger!" (Please note that the Huskies and I are preparing to pay-it-forward by nominating some blogs soon for awards as well. I'm happily reading lots of great blogs to them for their pawsome input). The Teacher's Pets for spotlighting our blog this week as their part of their Thankful FUR 3 Thursday Blog Hop. 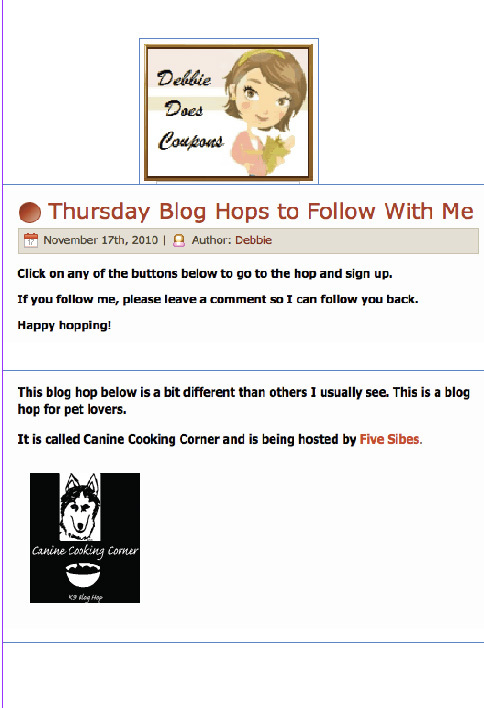 Debbie Does Coupons for highlighting our Canine Cooking Corner & FiveSibes as a "blog to follow" on her site! And to ALL our furpals, friends, readers, and commentors...Thank you! Thank you! Thank you! 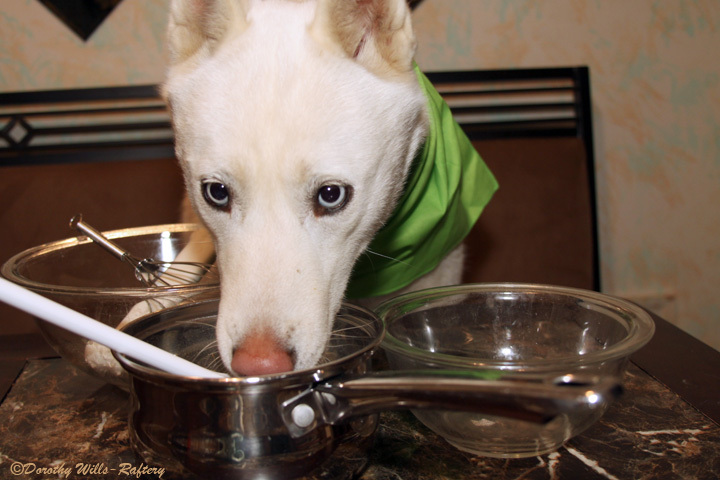 Introducing "Canine Cooking Corner," and it's a Blog Hop! Bandit is all ready to get cookin'! 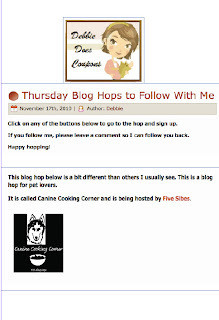 Since baking and whipping up treats in the kitchen (especially during the holiday season) is a favorite pastime for my daughter and I...and, of course, the Sibes...I thought I'd launch a new weekly blog hop called "Canine Cooking Corner" that will feature all kinds of snout-smackin' good recipes for our furpals. There will be recipes for healthy kibble add-ins, quick-n-easy nutritional dishes, homemade treats, and some healthy scratch recipes. I should add here that two years ago, when my boy Gibson was diagnosed with epilepsy and put on two kinds of medications, he gained 14 pounds as a side effect of the meds (voracious appetite). I became inventive with the add-ins (i.e. green beans, pumpkin, carrots, etc.) 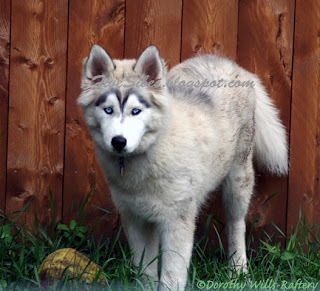 as a way of giving him healthy, fiber-rich foods that will fill him up, but not fatten him up. I'm able to keep him at a steady weight now - and decided to share the healthy add-ins with the rest of the furfamily. And it's all vet-approved! If you'd like to join in--and we sure hope you will--and share some of your dog's favorite K9 recipes, please do so! From the raw diet to healthy additions and nutritious gravies to canine sweet treats and fave foods, we want to hear and pet-test them all! Photos, videos, and directions are all welcome! To kick-off this week's hop, we will share a video recipe of one of the FiveSibes' all time fave dishes - and naturally, one of the ingredients is salmon! Now, this is not a scratch dish, but rather a fast-food healthy add-in that can be whipped up in just a few minutes. It also contains green beans, which is a healthy, lo-cal fiber addition to any recipe. So grab a hot mitt and a mixing bowl, and put those puppies to work! Bon Appétit! 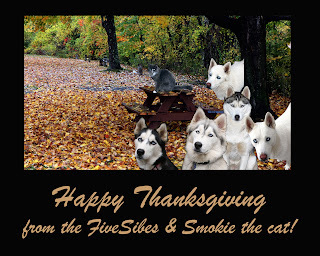 Woos to all our Husky, canine, feline, and equine friends out there in Blogland! 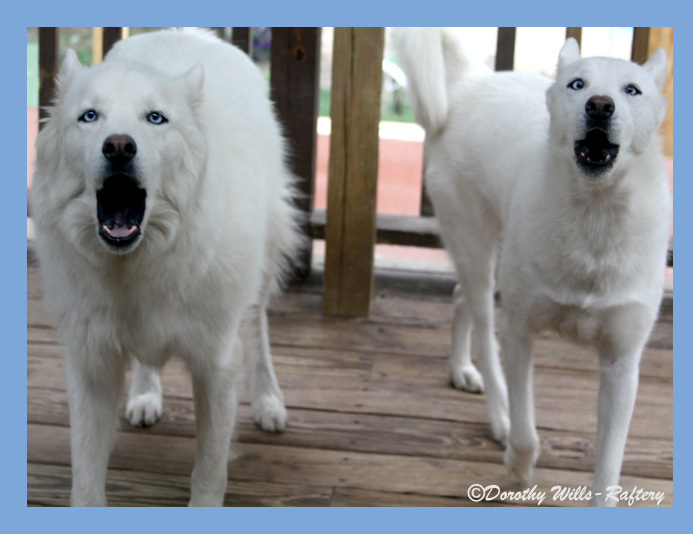 Wolf and Chloe of the FiveSibes pack here. 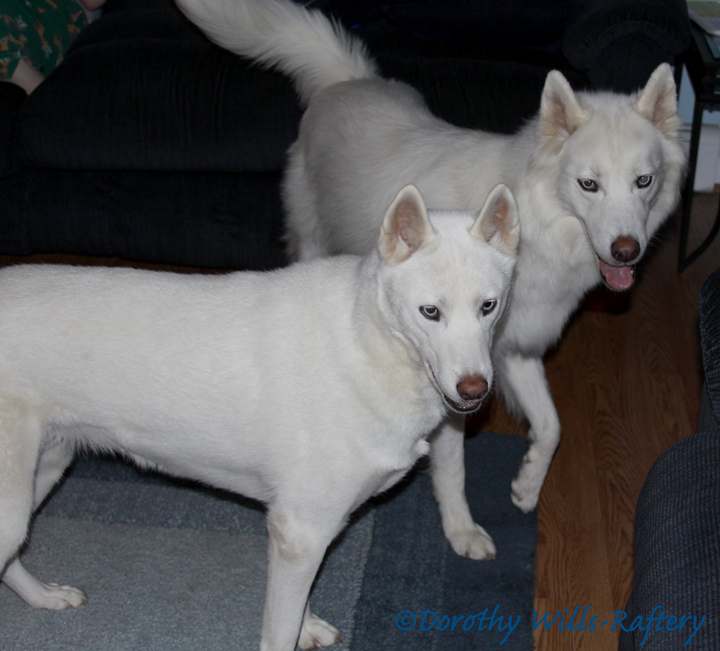 We're very excited to be "guest bloggers" today (as we always have a lot to say!) Unfortunately, Hu-Mom sprained her knee. She'll be wearing a funny knee brace for about two months, which she's not too happy about! And our big brother Gibson is off to the vet's today as he has an icky eye infection. So while Hu-Mom is busy icing her knee and big bro is at the vet, we thought we'd help out by taking this opportunity to go online and join all our furpals for the Saturday Blog Hop. We hope everyone's weekend is a great one! 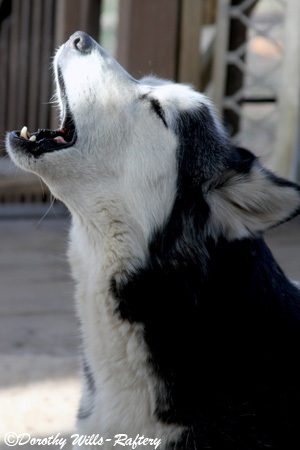 Stay happy and keep on hopping and howling! 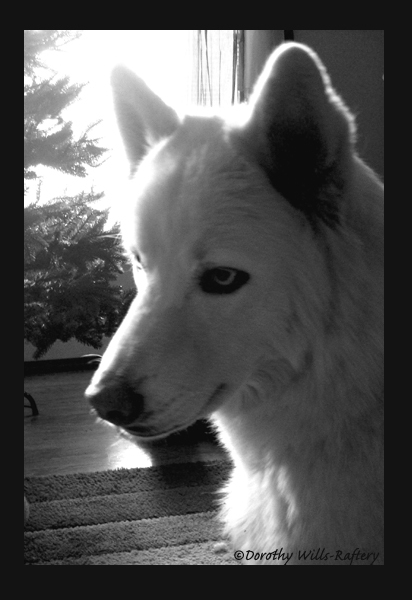 Wolf takes a moment to reflect upon his K9 heroes. On today, Veterans Day, the 11th day of the 11th month...let us all pause at the 11th hour from our daily tasks to take a moment and offer our thanks to all of our veterans both past and present, as well as the soldiers currently serving - both human and K9 - for their faithful service. I'd like to dedicate this Veterans Day blog to my late father, a SSGT who served two tours during WWII. The first in the U.S. Army's First Division (the Big Red One), and the second with the Rainbow Division. My dad was a great lover of dogs and animals in general. Here he is pictured at his Army base with a couple of his furpals. Just how many different types of canines served as war dogs? According to the United States War Dog Association, in "January, 1942, not long after the attack on Pearl Harbor, the American Kennel Association and a new group calling itself 'Dogs for Defense' mobilized dog owners across the country to donate quality animals to the Army's Quartermaster Corps." 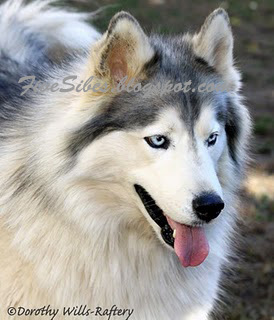 Among the breeds used, were the Belgium Sheep Dog, German Shepherd, Collie, Doberman Pinscher, Eskimo, and the Siberian Husky. VETERANS: WE SALUTE AND THANK YOU! 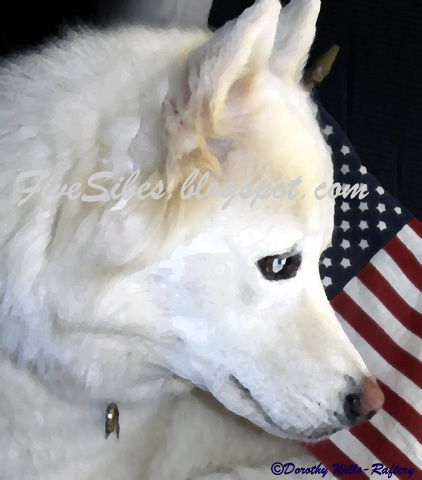 And thanks to The Teacher's Pets for today's Veterans Day Blog Hop! 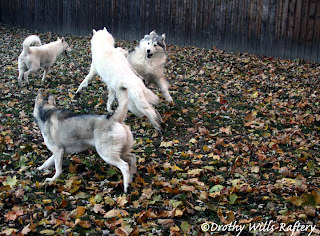 Bedtime Zoomies on a Wordless Wednesday! Gibson's checking the clock. He knows it's meal time! 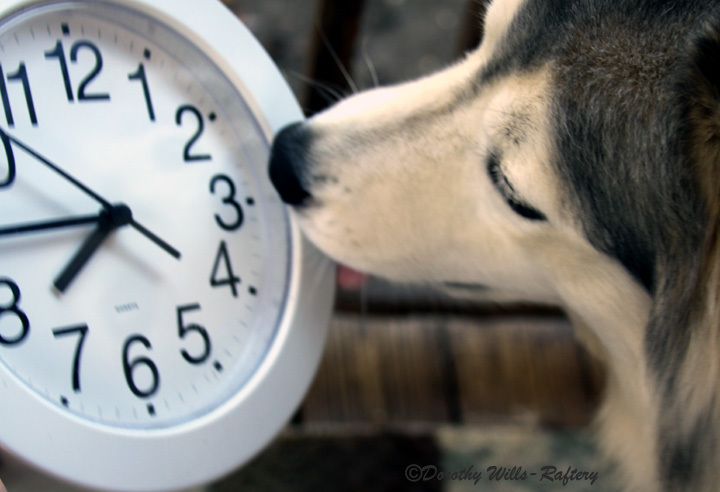 With the arrival of Daylight Saving Time, it's important to keep in mind that while we Hu-family members think we can get an extra hour of sleep, our canine pals don't really care about that - their internal clocks are what drives them. So if they are used to going out at 5 AM, they will most likely be getting you up at 4 AM (like one of mine did) because to them, it's really 5 AM! 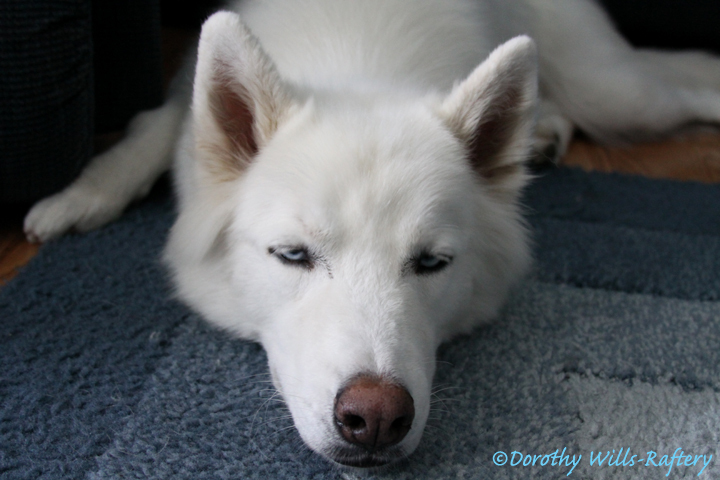 If your pets are on specifically timed medications, i.e. seizure meds (like our boy Gibson), at least for the first day of the new time change, stagger the dosage times. If your pet typically takes his medications at 8 AM and 7 PM, for today, give the AM dosage at the new fall-back time of 7:30 (true time would be 8:30, a half hour later than usual), and give the 7 PM dosage at 6:30 (true time would be 7:30). That way, while their internal clock says it's a bit late, their system can adjust to the "new" time and won't be going too long without the meds. Getting back on schedule is very quick, but I like to ease my boy in and keep those seizure meds as close to on-time (according to Gibson's clock) as possible. It's also a great time to remember to check your emergency pet window clings. (You can order a free Pet Safety Pack from the ASPCA online, which includes a window cling and Poison Control Center magnet. ADT also offers free Pet Alert Window Clings that you can order online as well as a list of fire departments in your area that carries them. You can also search the Internet for other clings if you'd like.) When checking your window cling, is it still afixed to the window? Is it legible? Did the sun fade the info? Are the number of pets and location still accurate? This is critical information for the Fire Department emergency personnel that could save your pet's life in case of a fire. Update your pet's emergency first aid kit. Check your supply of cold/snow season items. Be sure you have pet-friendly sidewalk ice dissolvers (not salt), natural paw de-icers (we use a nice oil- and lanolin-based protectant for the Sibes' paws before they go out into the snow and ice to prevent balling in between the paws and on leg and underbelly fur), clean towels for drying them off or removing ice balls from longer fur, and an outdoor dish that can withstand the cold and not freeze up their outdoor source of water. Pets will seek out shelters when outside. Be sure all leftover summer pool chemicals, BBQ gas tanks, pesticides, and sharp tools have been put away from their reach. Winter 'tis the season for outdoor hot tubs, so do a check to be sure the chemicals and fragrances are stored out of the pet areas. These areas may be OK where they are located in the summer, but in the winter pets can climb and dig through snow, giving them a different reach. So please, use a critical eye when winterizing their areas. As with people, this is also the perfect time to review your pet's meds and be sure they are all up-to-date. Toss away any that are expired. Update your home and cell phones with your vet, emergency vet clinic, and Poison Control Center numbers. Also be sure they are posted by your phone and are accurate. 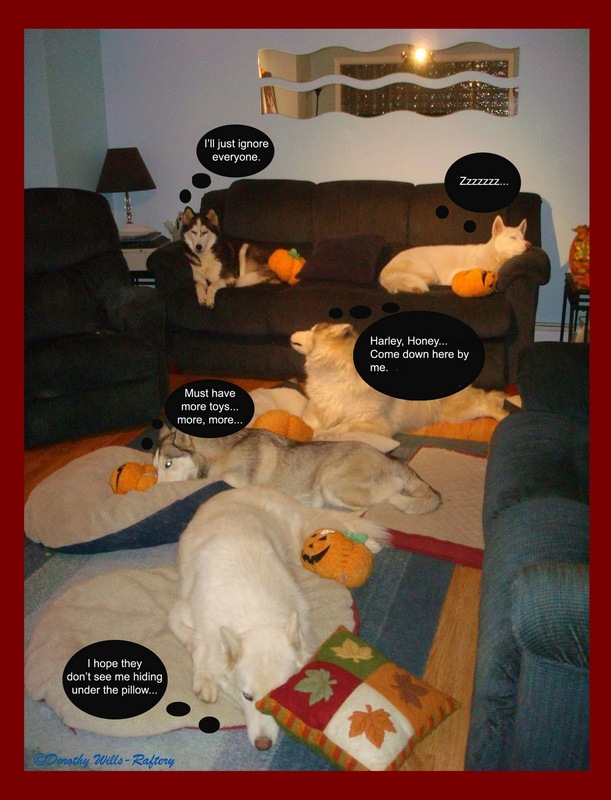 What do Siberian Huskies think about while watching TV?